Get ready for Halloween with the Krewe of Boo, which will be rolling on Saturday, October 22, 2016 at 6:30 PM. 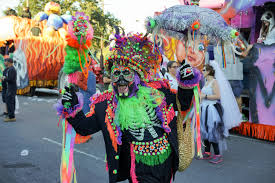 In 2007, the Krewe of Boo was named the official Halloween parade. The parade starts on Elysian Fields, where it goes through the French Quarter and the Warehouse District, then ends at the Convention Center. View the parade route! The floats, which are created by the Kern artists, are outrageous and fantastic and are designed to amuse and frighten you. Take a look at some of the photos from previous years’ parades: The Krewe of Boo has become an eco-friendly parade by changing the types of throws from beads and trinkets that were thrown away to now include objects that can be collected or consumed, such as doubloons, candy, imported collectible beads, and plush toys. On Friday, October 21, 2016 the Krewe of Boo’s Royal Luncheon at Broussard’s is scheduled for 12 PM – 3 PM and includes hors d’oeuvres, a 3 course meal and an open bar. The admission is $100. Please make reservations as soon as possible. Then on Saturday, October 22, 2016, the after the parade costume party, the Monster Mash, takes place at Howlin’ Wolf. General admission is $25. To purchase your tickets and to make reservations, click here!